Domini Games proudly presents the newest extraordinary chapter in the Enchanted Kingdom series. 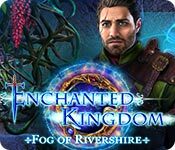 Enchanted Kingdom: Fog of Rivershire is rated 3.0 out of 5 by 8. Rated 5 out of 5 by BooksandGameFan from I'm Loving this game! I'm having a whole lot of fun playing this game! I think it's fantastic. Great scenery and graphics, music is very appropriate and at times absolutely beautiful! Hidden Object scenes are fun and interactive (wish there were more of them, less of the mini-games) mini-games where not mind-blowingly different from what we normally see in these games but a few were a bit different. You have a custom mode where you can make the mini-games easy or hard, you can get rid of sparkles, change the size of your cursor, there's a match three if you don't want to do the hidden object scenes and the hint recharges really fast! This game is far better than most of the reviews on CE page have given it credit for. It appears if it's not one of the few WOW real 5+ star games than people have to downvote it or not recommend it, after only playing the short demo, which I find very sad because the designers put a lot of time and effort into these games and most are much better after the demo ends! It seems many who do like and purchase don't leave positive reviews but those we don't actually purchase are really quick to leave a negative review?? Yes, it's similar to the last game as it's a continuing series and you are the healer so......... you still have to use your healing kit to heal! It's the reason I loved the last games and why I'm loving this one. The scenery, and hidden objects, as well as the games, are different in this game than the last game so it's a whole new and enchanting experience! If you are in the mood to once again save the world or in this case, the kingdom and it's people and you love making potions as I do, all while in a pretty colorful yet a bit creepy environment, if you want a fun, relaxing semi-easy breezy game then come on let's play! Yes, I highly recommend! Rated 5 out of 5 by biscuitsmama from HONORED HEALER CAN YOU STOP THE SPREAD OF THIS HORRIBLE DISEASE AND SAVE THE TAR EMPIRE? This is the third game in the Enchanted Kingdom series and once again you play the game as the Tar Empire’s Honored Healer. Although I enjoyed the first two games Fog of Rivershire is even better than the others. I beta tested the game months ago and I have been waiting for its release since so there was no question that this game would be an instant purchase for me. My review is based on playing the full game. I don’t like to give too many details when writing a review but tend to rely on communicating my feelings about a game rather than providing too many details that might give away too much. The Tar Empire is under attack by a terrible illness that turns those infected into monsters. Even the Medico Imperium healer assigned to the distant village of Rivershire could not withstand the effects of the disease and was locked up to prevent him from harming himself or others. Xander a warrior from the village has been stricken as well but he managed to arrive at the Medico Imperium to inform Dr. Klein of the situation and to enlist the aid of another healer. After seeing Xander, Dr. Klein believes that this is a demonic illness and because of your magic protection you are the only one capable healing the villagers and putting an end to the illness. Travel the perilous road to Rivershire and see what you can do to stop this horrible illness and to save the villagers and even the Tar Empire from the demon who is causing the disease. The graphics are really so much brighter in this game and coupled with excellent voiceovers the game provides the complete entertainment package for me. I like the game mechanics and using my Healer Kit to diagnose the illnesses I encounter and then to mix the cures. Bravo Domini for such an excellent game. Domini is another of my favorite developers and it is rare that I don’t purchase a game they create. I think that having a 56-page Strategy Guide is a good indication that this will be a nice long game. The game has an equal number of HOPS and Mini-Games. The HOPS are excellent and well-designed with a variety of styles. My favorite scenes are the list finds since I don’t care so much for the silhouette or storybook styles. For those of you who don’t want to find items in the HOP scene there is an alternate Match 3 game provided. The Mini-Games are excellent and in most of them we can choose either the easy or hard version when solving them. Some of the mini-games are a bit difficult and I found it a bit challenging to understand the objectives for a few of them. Although Domini does provide instructions for solving the mini-games they didn’t always make sense. This is when having the ability to replay the mini-games is a real benefit. Oftentimes I will go back and replay the mini-games in the extras section if I feel I didn’t do a great job of solving or skipped them the first time through. I also like to replay the ones that I really enjoy the most. Thank you Domini for including the replay in your extras for this game. If you enjoy the CE versions of a game this one includes the following extras: Collectibles include 15 Eggs, 15 Medallions, and 76 Coins to find and 26 Achievements to earn. Other extras include 10 Wallpapers, 10 Concept Art, 5 Music Tracks, 17 HOPS and 17 Mini-Games to replay, a Magic Laboratory, Medico Imperium, a Bonus Chapter, and a 56-Page Strategy Guide. I love this game! The Fog of Rivershire is so much better that the two previous games in the series and the scenes are so much more colorful and much lighter than in those games. The storyline is intriguing and is well-told. Even though there is an evil demon in the game I don’t find him as objectionable because the premise of the Enchanted Kingdom games is based on the struggles of the white magicians versus the dark magicians. In the first games we learned the history of the Tar Empire where all dark magic was defeated and banished from the kingdom and this game follows along that storyline. In spite of the bad guy it is an excellent game where I get to diagnose my patients and prescribe the healing medications they will need. Of course I must find the ingredients and then concoct the cures. 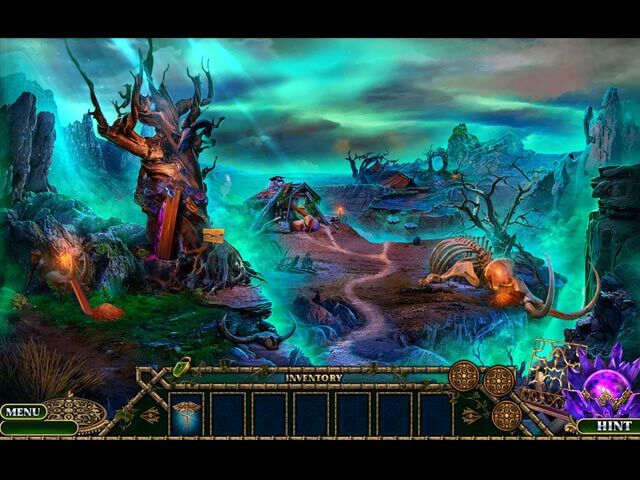 I tend to love fantasy games and then Enchanted Kingdom games by Domini are terrific and very entertaining. I have no hesitation in giving this game 5-stars and would rate it higher if that was possible. As always I recommend that you try the game to see if it is one you will enjoy. Happy Gaming!! Rated 3 out of 5 by ninja226 from Thy name is Healer This is not a bad game. It's just not a great game. If you like getting value for your money, this game fills the bill. This is a long game with lots of puzzles and relatively few HOPs. 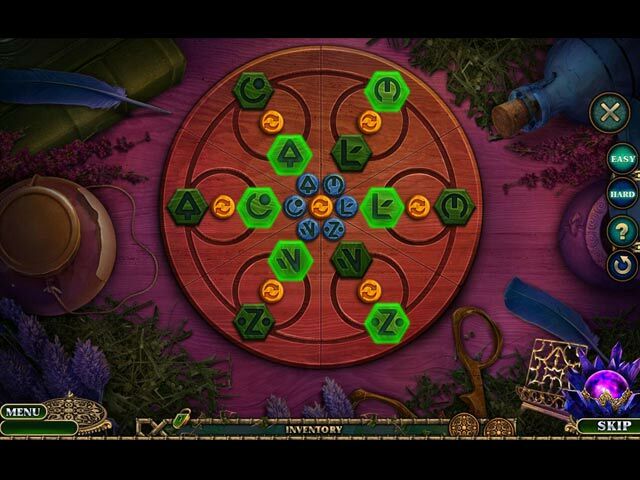 The puzzles can be played on hard or easy mode, and the Hard mode is quite vexing and a pain to solve. Expert mode disables Hint & skip, which increases the frustration level. The story revolves around a Healer (you) who has to diagnose (with diagnostic lens, bottom left) the infectious symptoms of inhabitants in the Tar Kingdom, find ingredients for the healing potion (HO quest), make the potion (Healer Kit, bottom left). The healed person is restored to health and gives an item to continue your quest. Not a bad story, but also not original, and kind of boring, maybe because no love interest (romance). The artwork is very good. Voiceovers are appropriate. Background music is nice, but uninteresting story and pain in the bee puzzles makes for a slow torture. I recommend a demo to judge for yourself. Rated 2 out of 5 by pennmom36 from IF I HAD SPECIAL GLASSES THIS GAME WOULD BE NO DIFFERENT THAN MYSTERY TALES Why do these guys make their games look so much alike? Most of their games have so much blue, it's nearly blinding, and if I didn't look at the title, I'd have a hard time telling the difference between this game and Mystery Tales, other than not having those stupid glasses, a gimmick that is simply swapped out with a healers kit! As far as the benefits of the Collector's Edition vs.this Standard Edition, I will say that, if you like collecting items (collecting because they aren't really hidden) this particular game has a ton of collectibles in the CE version, but it's a hard game to get into, because it's far too repetitive and at times boring. Here's a recap of my review to help you decide which version, if either is right for you: Apparently, the citizens of the Tar Empire could use a Snickers bar, because they are becoming little demons with a big attitude. It's a good thing I'm immune to any and all diseases, because this demonic plague transforms an average adult into a horned beast with green glowing eyes. Six-inch horns protruding from almost every inch of their bodies, amazingly has no lifelong complications once I work my magic, not even a scar remains, but then again, I am THE Honored Healer! I've got everything I need to perform this exorcism, Healer's Kit, check! All seeing Diagnostic Lens (aka magnifying glass, hey, I'm not Wonder Woman), check! A Quill that magically writes and draws pictures with several different colors at the same time without needing ink, check! A Dagger given to me by a warrior guard to defend myself upon this dangerous mission, check....cancel that check, because I discard it after one use, and have to revert to burning ropes when I could have just hung onto the dagger! So now I mount my trusty steed, hoping he doesn't catch the plague, otherwise it's going to be a miserable road trip. I ditched my dagger for some odd reason, but I hung onto a small metal pin, because my healing ability senses told me I'd need to fix a door hinge, and I was spot on, I did indeed need a door hinge pin on my first leg of the journey! After curing a very grateful fellow healer, I wave goodbye and continue my journey, why not, two healers is just a crowd right? My next stop is at the witches hut, which was weird, why? Well, the witch wasn't able to whip up her own witch hazel wellness cure, which was worth wondering about when I realized her witchy witch-hut was locked from the inside...this is going to be a long journey! Normally, I'm not a fan of recipe making mini-games, because there's usually no skill involved, it usually entails throwing ingredients into a cauldron in a specific order, and half the time it doesn't allow you to place the wrong ingredient in the wrong order. However, I don't mind the Healer's Kit mini-game as much, because at least you have to make educated guesses. The first step is to use the Diagnostic Lens to examine the patient, which cannot be done incorrectly because it glows a reddish-pink to alert you to click on an area you can basically already see with the naked eye, to begin with. After zooming into the affected area, you have to click once again to select it, which automatically queues that magic quill to jot down the findings in the Healer's Book. Now that you've made a diagnosis, that same magical quill draws some beautifully detailed pictures in every color imaginable, of the ingredients you'll need to whip up a demon hex cure. Once you have found all of the ingredients, you open up the Healer's Kit, and play a mini-game to complete the potion, which for some reason is different for every patient? 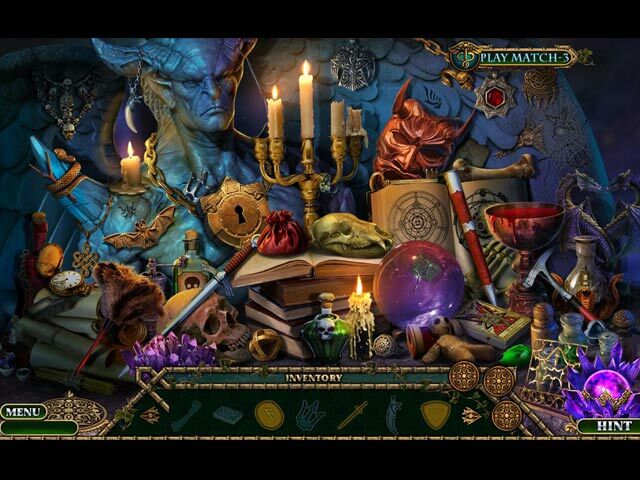 The Hidden Object Scenes are varied with Silhouetted Shape finds, Interactive list finds, Keywords in Sentence finds and replacing items correctly back into the scene. There are also several smaller Zoom Zone HOP's, and there is an alternate Match 3 game available in the CE version. The Mini Games are available in either an Easy or Hard mode, which is a fantastic feature that I wish all games included. Below are brief descriptions of some of the games you'll encounter during the demo: 1) Diagnostic Lens game, click on suspicious areas of interest 2) Healer's Kit game, place ingredients logically, test solution. 3) Guide your horse through a maze while avoiding monsters. 4) Use all directional tiles to guide bronze tile over all cells. 5) Connect all the dots without overlapping. 6) Light symbols using clockwise or counterclockwise buttons 7) Reassemble the symbols by rotating discs. 8) Select buttons to swap tiles to match the clue shown. 9) Choose cup that contains a butterfly wing in a shuffle game 10) Repeat the sequence of flashes the demon makes. The Collector's Edition version has 10 Wallpapers, 10 Concept Art pictures, 5 Music Soundtracks, 17 re-playable Hidden Object Scenes, 17 re-playable Mini Games, 26 Achievements to earn, 15 Collectible Creature Eggs (click to hatch within the Medico Imperium) 15 Collectible Medallions (represents a different theater personality) 76 Hidden Coins (used to buy 15 Magic Lab items) Missing Journal Notes to find, 5 Chapters + Bonus Chapter and a built in Strategy Guide. ENCHANTED KINGDOM GAMES AVAILABLE Title***Collector's Edition Release Date***Average Rating 1-A Dark Seed (April 6-17) 3.9 2-A Stranger's Venom (September 28-17) 3.7 3-Fog of Rivershire (February 22-2018) 4.0 by: Domini Games Domini Games Available Enchanted Kingdoms, Dark Romance, Labyrinths of the World, The Christmas Spirit, Mystery Tales, The Curio Society, Travel Adventures, Island of Death, In Search of the Lost Temple, Mysteries of Ancient Inventors, The World's Legends. Rated 1 out of 5 by vEnnie57 from Boring I'm sorry to all those who actually liked this game, but I thought it was the worst game I have played in a long time. It's a very good thing it was a freebie. Rated 1 out of 5 by roaming from Review Based on Demo Only This was so boring and repetitive, I can't believe I played the whole demo, but (yawn) I did. Yay me. Each "chapter" was exactly the same as the previous one. Some character has contracted an "illness" and has been partially turned into a monster. It's up to you to diagnose the progression of the illness using your special lense and then gather five ingredients to make a healing potion with your potion-making box.. Once the character has been healed, they give you a gift that will help you to heal the next victim. Nothing about this game, at least not during the demo, is creative or new... not the plot, not the graphics, not the characters, not the HOS or mini-games. It's a perfect example of why I've been mostly replaying some of the older games in my cache instead of wasting money buying new ones.